There is a danger that Christian art, when it is removed from the domain of personal or collective worship – the monastery, chapel or church – loses its meaning. Objects created to instil awe and aid meditation and prayer may offend those who are religious if they are taken away from their original context. At the other end of the scale, profoundly religious images may be off-putting to the non-believer. Western art lovers may be used to Renaissance iconography and at ease with Biblical stories re-told in the art of many of the worlds’ great museums. We tend not to have problems with the thousands of generic annunciations, calvaries, and even the crucifixions that line their walls, but the work in this show is somehow much more deeply sacred. 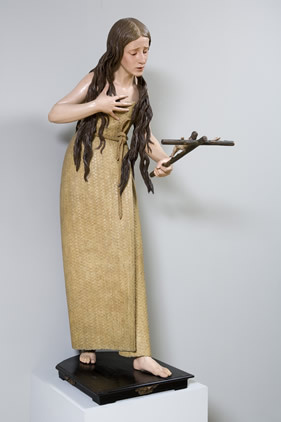 Walking in the dark among these 16 sculptures and 16 paintings feels transgressive. The atmosphere is curiously hushed and reverential – no matter that we are in 21st century central London, not closeted in a monastery on the Iberian peninsula. A daring exhibition, it goes one step further than other shows of the kind – the penumbrous subterranean rooms of the National Gallery’s Sainsbury has never been imagined quite like this or looked so dramatic. A palpable and even scary sense of mystical reverence is immediately communicated by sharply focussed lighting and dark walls. The artists strive for graphic reality – almost gruesomely at times. A decapitated head is a simulation of real anatomy. Glass eyes and tears abound. Bull’s horn for Christ’s fingernails, bark of the cork tree to simulate blood (this show is bloody), ivory teeth … this is a different realm than Renaissance Italy. A dark night of the soul is conjured up by a cleverly managed theatrical mis en scene and the curators have unashamedly created high drama. Statues and paintings have been brought to London from the ornate, gilded churches of 17th century Spain. 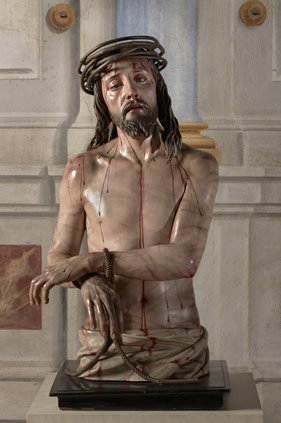 Notable museums have graciously lent their treasures, such as the particularly fine crucifixion by the great Francisco de Zurbaran from the Art Institute of Chicago, deftly re-invented by the National gallery curators as an arch as it was originally. The Prado has lent the tragic Mary Magdalene Meditating on the Crucifixion by Pedro de Mena, her all too human flesh and its failings cased in a wrap of straw. 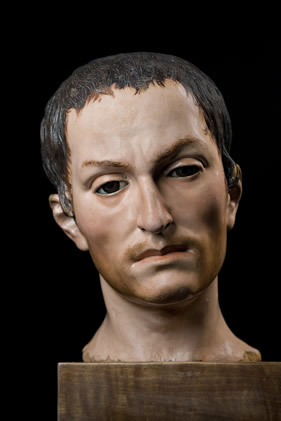 The Museo de Bellas Artes in Granada has lent their Saint John of God by Alfonso Cano – a bust so real and human that his beads of sweat glisten on his brow. Works such as Montanes' Saint Francis Borgia have come from the Church of the Assumption in Seville and we might be in that most strange and magical of cities down here in the basement of the National gallery. The Dominican, Carthusian and Franciscan orders have yielded up these works to the museums and they achieve a meaning outside their original walls that is transcendent. Supreme icons of the Spanish Counter- Reformation, and emblematic of High Catholicism, their meaning is enhanced by their installation in a secular context. Saint Francis Standing in Ecstasy of 1663 , by Pablo de Mena, for example, has never before left the sacristy of Toledo. The thesis of the show is fascinating and well argued. The laws of the painting and sculpture guilds of 17th Spain decreed that polychrome statuary (painted wood) had to be painted by separate guildsmen. Thus, the wood carvers did their thing and then had to cede their masterpieces to the painter’s touch. The curators argue that great painters such as Velasquez and Zurbaran were trained initially as painters of polychrome statues and their thesis is reinforced by the fact that in Seville, Francisco Pacheco, a great polychrome artist, was Velasquez’ teacher and also later his father-in-law. The Zurbarans and Velasquez are worth a trip alone, but to see them in the context of the polychrome statues is one not to be missed. An accompanying investigation into the technique of polychrome painting of statues is in Room 1, admission free, and is highly recommended.